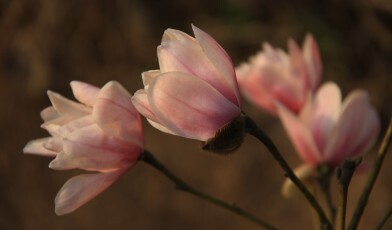 Magnolia sinostellata populations are declining in number in the wild which could lead to extinction if action is not taken soon. 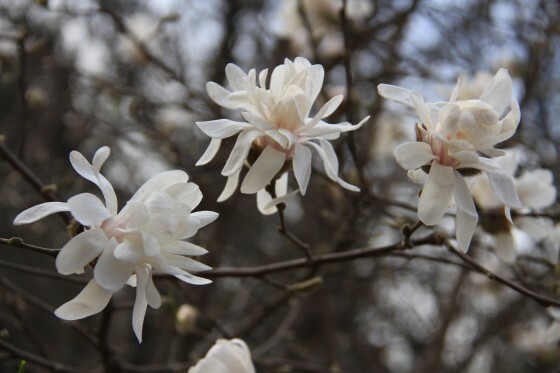 It is an excellent horticultural plant valued for its uniquely shaped, fragrant flowers, attractive habit and its ability to tolerate wet conditions with moving water. However, these attractive qualities have also contributed to its endangered situation, as it has often been removed from the wild and transferred to commercial nurseries. M. sinostellata is a deciduous shrub or small tree to 2.4m tall, with slender twigs and papery elliptic leaves. The flowers are fragrant, chrysanthemum-like and composed of many slender tepals. The color of tepals are diverse, white, light pink, pink, white with red midrib. The taxonomic validity of M. sinostellata was controversial for a long time due to its morphological similarities to M. stellata of Japan. However, DNA research led by Fairylake Botanic Garden in China proved this was indeed a separate species. Research also confirmed that as populations of this species are declining and some populations experience reproductive difficulty, genetic diversity is also declining. This species was first found at Caoyutang Forest Farm in Jingning County, Zhejiang Province, China. About 200 individuals can be found here growing at an elevation of between 950 and 1200m. The population here produces few flowers and rarely yields fruit and consequently very few seedlings can be found in the scattered wild population. The species has recently been found in three more localities in southern Zhejiang Province. The first was found in a forest in Songyang County, about 300 individuals grow here in open forest or scrubland along a valley at 700-1260m. Individuals here produced some fertile seeds, and young seedlings can be seen in some places. The second population, near the top of a mountain (885m) in Wenshou County, comprises of 5 plants. These individuals are less than 1.5m tall but are attractive as they produce root sprouts and form big clumps with many flowers. It has been assessed as Endangered on the IUCN Red List (2015) and the upcoming Chinese Red List assesses this species as Critically Endangered. 60% of Saint Lucians use resin from the lansan tree, principally as a slow-burning incense during religious ceremonies.